Artist Reply: Thank you very much, Ruth! So colorful and happy card ! Have a super 2015. Artist Reply: Thank you so much, Sigga! Happy New Year to you! Artist Reply: Thanks a lot, Brenda! Happy New Year to you too! Artist Reply: Many thanks Bev! Happy New Year to you as well! Such a Bright and Happy looking.So Very beautiful Design & flowers. Artist Reply: Thank you so much, John! Wishing you an awesome New Year! Happy new year anneka. What a beautiful card and thanks for all the wonderful comments! Artist Reply: Thank you very much, Curtis! Happy New Year to you too! THANK YOU ANNEKE. THIS IS OUTSTANDING & BEAUTIFUL. MAY YOU & YOURS HAVE A VERY HAPPY & HEALTHY 2015. Artist Reply: And you too, Sharon! Thank you so much! Artist Reply: Thanks a lot, Joanie! All the best wishes for you! Marvelous creation Anneke! Happy New Year to you too. Artist Reply: Thank you very much, Seth! I wish you and yours a beautiful New Year! Lovely card Anneke!!! I wish you a 2015 with much happiness, health and prosperity !!! Hug my friend! Artist Reply: Thank you so much, Angel! Wishing you a great 2015! 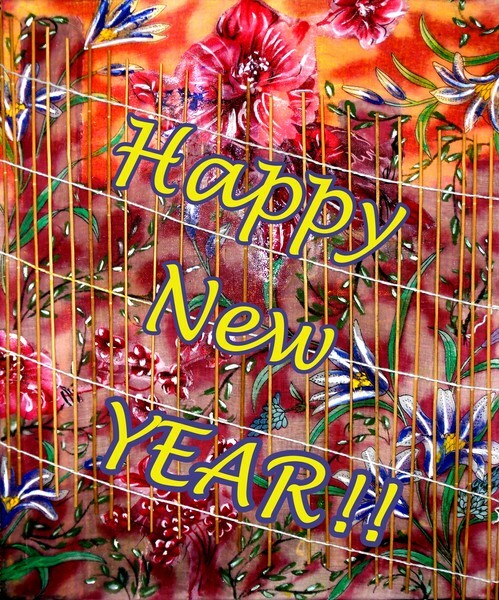 Happy New Year dear Anneke and all the best wishes for 2015. Love this composition. Wonderful colors!!! Artist Reply: Thank you very much, Ingrid! A very happy New Year to you too! Artist Reply: Many thanks, Stef! I wish you and yours a great New Year! Beautiful! Happy New Year Anneke. Artist Reply: Thank you, Lillian! A happy New Year to you as well! Artist Reply: Thanks a lot, José! Wishing you all the best for 2015! superb card,great concept...thank's for your wishes,truely apreciated...I WISH YOU A HAPPY NEW YEAR 2015 for you and yours !! Artist Reply: Thank you so much, Yves! A very happy New Year to you too! Artist Reply: Many thanks, Suri! May the new year be wonderful for you! Artist Reply: Thank you very much, Vernonette! Have a great year as well! Gorgeous card for your best wishes, Anneke !! I wish you all the best for 2015 !!!!!!!!!!!!!!!! Hugs !!!!!!!!! Fantastic happy colours, Annekke... With a fence above it. Wishing you the very best, for 2015.MY POD! Artist Reply: Thank you very much, Nira! Wishing you a beautiful New Year too! Artist Reply: Thank you for the wonderful words! My best wishes to you too! HAPPY NEW YEAR FOR YOU TOO AND YOUR FAMILY . LOVE. PEACE. AND GOOD HEALTH .THANKS SO MUCH FOR THE PAST YEAR AND YOUR KIND COMMENTS. HAVE A NICE DAY !! Artist Reply: Thank you so much, Marie josé! I wish you a very happy New Year!